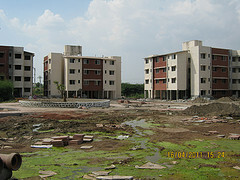 Developers have taken loans from the banks and housing finance companies. Some of the builders have even taken loans from private equity firms which normally lend loans at 25 to 30 %. Still, builders are forced to cut down prices as many of the projects remain without any demand as buyers’ sentiment has been hurt by the sky rocketing property prices. It seems that they are not resistant to rate cuts. Then who resist? It seems that housing finance companies and banks are against the rate cuts as they have lent loans to both the builders and the buyers. Occasionally they have lent to the buyers even more than 100%, remember the RBI has limited loans up to 80% of the total amount. Though properties are left vacant, property prices remain unaffected. Before RBI limited the loans to 80% of the total amount some couple of years ago, many builders had already lent buyers full amount as loans. Some of the builders had even lent more than 100%, as they had paid the Stamp Duty Charges and other registration charges for the buyers. There were still others who offered home- improvement loans even. Knight Frank’s July 2012 Report shows that over 80,000 housing units are left without any demand. Each of the unit will value around Rs.1.2 Cr average. This is the situation of Mumbai alone where the builders are still reluctant to cut the property prices down. Another 50000 to 100000 units still remain as vacant, yet not for sale, as there is no taker for these units. If there is a price correction, then the investors will be the first to exit. Surely, if the price correction happens, even those who hold second-hand or even third-hand properties will not avail their properties for sale. In any of the case the financiers and the builders will suffer. To be precise the builders will suffer more as they already have non-income generating properties, in plenty. In short, there is no chance for a price correction soon. This entry was posted in Articles, Real Estate News and tagged Home Loans, housing finance companies, Knight Frank, price correction, Property Prices, Real Estate Market by designer. Bookmark the permalink.